Channel Islands Naturalist Corps (CINC) are a group of specially trained volunteers dedicated to educating passengers on board whale watch vessels visiting Channel Islands National Marine Sanctuary and Channel Islands National Park (CINP). Volunteers are also trained to lead island hikes within the national park, participate in numerous local outreach events and to conduct citizen science, including the collection of valuable research on marine mammals and other important sanctuary and park resources. CINC are in integral part of the sanctuary and park’s education and outreach programs, providing information about the unique resources found within the sanctuary and park to thousands of area residents, visitors, and school children annually. 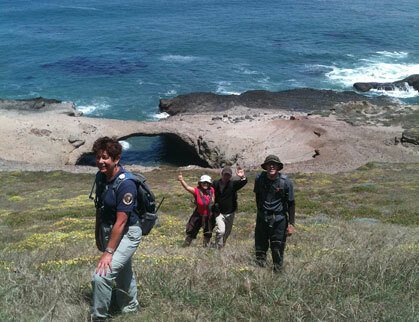 Volunteers accepted into the program are specially trained about sanctuary and park resource protection programs, interpretation techniques, and an overview of the physical, biological, and cultural aspects of the Santa Barbara Channel and the Channel Islands. The CINC program is made possible through a partnership between the sanctuary and the park and with park concessioners and participating boat operators out of Santa Barbara Harbor, Ventura Harbor, and Channel Islands Harbor. For more information about this volunteer position please click on the How to Apply button on the navigation to the left. If this volunteer position is not right for you, please consider other ways to get involved with your sanctuary or park.